2015 Lexus RX 200t review | What Car? The Lexus RX has long been a popular choice for those seeking a refined, comfortable and reliable luxury SUV. Since its launch in 1998, some 2.2 million have been sold around the world. It’s Lexus’s best-selling model by a long stretch; out of every 10 cars sold, three rolling out of the showrooms will be an RX. The second generation marked the introduction of a hybrid powertrain, widening the RX’s appeal by offering low emissions, a key factor for company car drivers, and high claimed economy figures. It has always struggled against more spacious, better-driving rivals like the BMW X5 and Range Rover Sport, however. This, the new fourth-generation version, looks to address some of the previous models’ failings and to make it a more tempting alternative to the mainstream alternatives. Lexus has widened and lengthened the RX, increasing interior space. It has also overhauled the chassis, adjusting the suspension and steering to improve the SUV’s handling. Externally, it gets revamped styling that brings the looks into line with the rest of Lexus’s current range. The cabin has been comprehensively redesigned, too, featuring better materials and more comfortable seats. A range of modern features are also on offer, including a new head-up display that can project a variety of information directly into your eye line, including sat-nav instructions. More notably, you can now also opt for a new model called the RX 200t. This comes with a 2.0-litre turbocharged petrol engine, instead of the hybrid RX 450h’s 3.5-litre V6 and electric motors. It’s not as efficient or as fast, but it’s more affordable. The two-wheel-drive RX200t S starts at £39,995, which is a substantial £7000 less than the entry-level four-wheel-drive RX 450h. You get masses of kit in all versions of the RX, including sat-nav, electric heated seats, dual-zone climate, LED headlights, parking sensors and adaptive cruise control. The car tested here, however, is the flagship F Sport model. It costs £48,995 but gets four-wheel drive, sporty-looking trim and exterior upgrades and more kit, including a premium navigation system with a bigger screen, 12 speakers instead of nine, a wireless smartphone charger and adaptive suspension. What’s the 2015 Lexus RX 200t F Sport like inside? The RX’s interior is finished to a suitably upmarket and luxurious standard, with fine materials used throughout and slick, well-engineered controls. There’s plenty of room up front, with big footwells and a wide range of adjustments that make it easy to get comfortable, and you can even sit three adults abreast in the back. The centre passenger will have less head room than those in the outer seats, though, because of the slightly higher seating position. It's the attention to detail that really lends a high-class feel to the RX's cabin. In rival cars you might find that the handles for shutting the door are made from a hard plastic with sharp edges. In the Lexus, however, they are trimmed in soft leather and fabric. You'll find some great practical touches throughout, too. For example, the door bins are big enough to take A4 files and they can be expanded to accommodate bigger items. That said, the boot's still not that big. There's 453 litres of storage space on offer with the rear seats up, which is around 200 fewer than you'd find in the BMW X5. You can drop the rear seats to increase room if you want it, though. Visibility out of the cabin is good, and parking is made easy thanks to front and rear parking sensors. In short, the RX's cabin is a very pleasant place in which to travel. The infotainment system is a little tricky to use compared to Audi and BMW systems, however. Instead of a simple rotary dial, it relies on a mouse pointer system for navigation. Until you get used to it, it can be a bit fiddly. Otherwise, it works well and the sound system is of a high quality. What’s the 2015 Lexus RX 200t like to drive? Despite the F Sport’s adaptive suspension, the RX 200t still lags behind the likes of the Audi Q5, BMW X5 and Range Rover in corners. It doesn’t have as much front-end grip, its steering doesn’t offer as much feedback and its body moves about more. That said, Lexus’s upgrades have definitely improved the RX; its steering has a decent weight to it and feels a little more precise, and although it rolls in corners it doesn’t lean to an uncomfortable extent. It’s only when you start to push harder that it gets flustered, unlike its rivals, but when driven sensibly it’s comfortable and relatively composed. The new 2.0-litre turbocharged engine, which sends its power to all four wheels via a six-speed automatic transmission, is quietly impressive. It’s smooth, relatively refined and accelerates the RX 200t with ease. That’s impressive, considering that the car weighs around two tonnes. From a standing start it’ll get to 62mph in an acceptable 9.5sec, and it has enough mid-range pull to avoid overly frequent gear changes elsewhere. The gearbox does a good job, too, changing smoothly and quickly enough, while wheel-mounted paddles allow for more control when needed. Stopping power is plentiful, and the four-wheel-drive system means you never struggle for traction in normal conditions. While it might not be as fun to drive as some competitors’ offerings, the RX rides in a softer fashion. Even sharp bumps don’t unsettle it and little suspension noise is transmitted into the cabin. Wind and road noise is impressively low, too, making it a more relaxing car to drive over longer distances. Considering that ride quality, refinement and comfort is one of Lexus’s key selling points, it’s good to see this hasn’t been compromised by the revisions made to improve the handling. The only real downside to the 200t is that it’s not very efficient, particularly compared to turbocharged diesels offered elsewhere. Lexus claims it’ll average 34.9mpg, while its emissions are quite high, at 189g/km of CO2. Not great news for company car drivers, but private buyers who don’t do many miles won’t suffer too much, outside paying £265 a year in road tax. The turbo petrol is more refined and eager than some similar diesels, though, so it’s not devoid of merit. 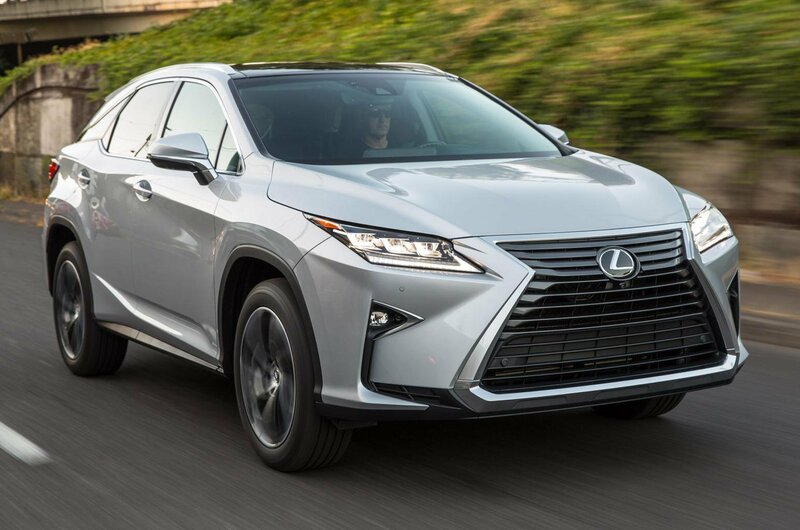 Those in the market for a luxury SUV that’s well equipped and easy to live with would do very well to consider the latest version of the Lexus RX. It might not be the most practical choice but compensation comes in the form of its comfortable, upmarket cabin, a supple ride and excellent dealer support. It’s also a far less costly option than many of the mainstream offerings, such as a Range Rover Sport or Audi Q7. You’d have to spend thousands, if not tens of thousands, more on one of the alternatives to match the specification of the Lexus, so it represents value for money in that respect. However, we’d be inclined to opt for the RX 450h hybrid version instead of the 2.0-litre turbo. While perhaps not as engaging to drive, the hybrid is faster, more relaxed and potentially more economical in the real world. It’s also a far cleaner option, offering much lower monthly company car tax costs and lower annual VED costs. You will have to pay an extra £4000 for the hybrid, however, if you want to stay in F Sport specification. The less sporty-looking and feeling Luxury version of the RX 450h is only £1000 more than a 200t F Sport, though, which would be a much more tolerable and easily justified hike. You wouldn't lose out on a great deal, either, unless you're really sold on the F Sport's looks.